Think B 4 U Print at BHS Library! Thanks to Mr. Grande for the information and links posted here. 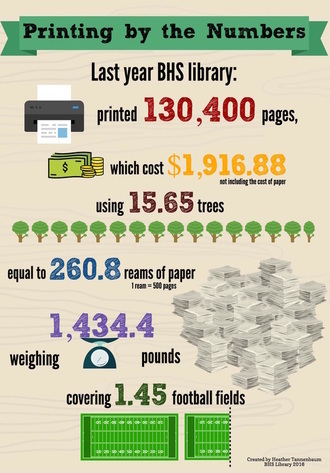 At BHS we use 1200 boxes of paper a year; that's about 720 trees or 18 sheets per student per day! Each day we toss out thousands of pages of paper and countless ink cartridges. When we use paper, we contribute to deforestation and release carbon dioxide (CO2) into the environment which causes the earth to warm. Printing requires plastic ink cartridges that are difficult or impossible to recycle. Plastic packaging uses fossil fuels which releases CO2, and spent containers pile up in landfills and may release polymers into lakes, streams and oceans. Recycle or reuse paper. Ask teachers to accept assignments on the other side of used paper. Reuse other side of homework. Ecofont: Download font which uses 20% less ink (you may have to drag font icon into your font folder after downloading). Scanning and posting handouts electronically: Encourage teachers to scan handouts at the Copy Center and have them emailed electronically to their inbox—in seconds! They can then be posted on websites or emailed and read online.